This adorable little piglet was created by Taunya Castillo, the owner behind the online boutique shop Put A Bonnet On It. Porter is made from the Thistle sculpt by Cindy Musgrove and was rooted with our Straight Yearling hair in natural white and black. Click HERE to follow Taunya’s page on Facebook! This pretty little girl was created from the Realborn Priscilla sculpt by Bountiful Baby. Esther rooted her using our wavy yearling mohair in Auburn. Click HERE to see more of Esther’s incredible work! This lovely little darlin’ was created from Bountiful Baby’s Ashley Awake Realborn by Katina of Katina Lee Babies. Her hair was rooted with Wavy/Curly Yearling mohair in Ash Blonde and looks cute styled either curly or straight! Click HERE to view more of Katina’s beautiful work on her Facebook nursery page. This lil’ pup is so happy now that he has a new head (ahem…body) of hair! He is an original silicone WerePup baby by Asia Eriksen who was re-rooted by Sam of Babies on the Other Side Nursery. Pax was rooted with our Straight Adult mohair in Natural White and Black. Click HERE to see more of Sam’s spooky work! Isabella is a Nikki Johnston sculpt- brought to life by the talented Lisa May Williams. She was given to a very lucky lady in a reborn giveaway on the Amarantine Babies Facebook page! Click HERE and click ‘like’ to follow Lisa’s page, and click HERE to view her website. Another amazing baby from Esther of Gracious Bundles Reborn Nursery! This doll was made using the "Natalie" kit by Denise Pratt, and rooted with our wavy kid mohair. Click HERE to view Gracious Bundles Reborn Nursery's Facebook page, and follow along as Esther shares her adorable creations. This beautiful little baby was created by Esther Romain of Gracious Bundles Reborn Nursery. She was made from the Megan sculpt by Pat Moulton. Her uniquely colored hair is a crowd favorite! Click HERE to see more of Esther's incredible reborn babies. This version of Kase Awake, a limited edition kit made from a scan of a real baby, was reborn by Lisa May Williams of Amarantine Babies. View more of Lisa’s work at www.amarantinebabies.com , and click HERE to check out her Facebook page! This cute little Christmas baby was made by Carol Lance of Carol's Kids Reborn Nursery. He is the Realborn Charles sculpt and was rooted with our adult mohair in golden blonde. Click HERE to view and purchase more amazing dolls by Carol. This version of Precious Gift, sculpted by Cindy Musgrove, was reborn by Lisa May Williams of Amarantine Babies. View more of Lisa’s work at www.amarantinebabies.com , and click HERE to check out her Facebook page! These sweet babes were created by Alison Danley from the Shyann sculpt by Aleina Peterson and the Kameko sculpt by Tasha Edenholm. Alison is a brand new reborn artist, and she rooted her first dolls with our adult mohair. This baby was created by Victoria, the talented artist behind Milo's Meadows Reborn Nursery. She is made from the Sofia Grace sculpt by Natalie Scholl and rooted with our wavy yearling mohair in honey blonde. Click HERE to see more on the Milo's Meadows Facebook page. Sam Balmer-Mclellan is the artist behind the horde of frightfully adorable alternative reborn dolls at Babies On The Other Side Nursery. She is a Canadian artist who is incredibly gifted at bringing out the dark side of reborn sculpts. Click the button below to view more of her work and learn where spooky babies come from! Victoria Deviller is a Canadian photographer and reborn artist. Her business, Milo's Meadows Reborn Nursery, specializes in sweet, realistic baby dolls that are oh so cuddly! Victoria accepts custom orders, so contact her today to start collaborating on your dream doll! Click the button below to see more of Victoria's work. Lexi is a Texas-based reborn artist who specializes in fantasy dolls. Her work runs the gamut from cute and sparkly to dark and horrific. She is a creative soul who loves bringing out the fantastic in any project! 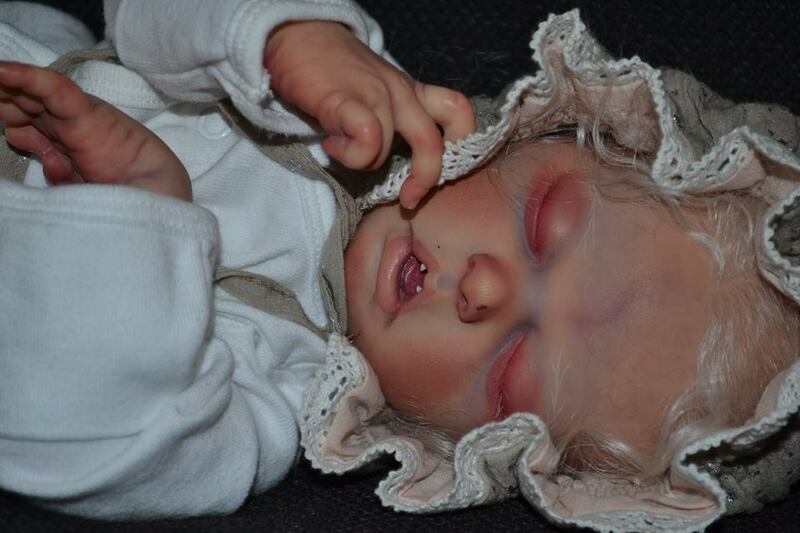 Click on the button below to see more of Lexi's alternative reborn dolls.